I don’t like taking pictures. I don’t like taking pictures for a variety of reasons. I don’t like it when my picture is taken either. I’m just not photogenic. Photography isn’t my thing, despite my background in media. That’s right, I’ve worked as a camera man. I have a large collection video and studio equipment. But this is all video material. Shooting 24 or 30 pictures per second? No problem? Taking just one in the time frame of several minutes? Big problem. Travel somewhere with even a remotely famous or iconic landmark and you’ll find them: dozens of tourists bundled together, just shy of climbing on top of another to take a picture, evidence they really were there. It’s the same routine wherever you go; a battle, a fight for your right to take a decent picture. Victory poses are all the same; a big smile, some throwing arms around one another. There’s also the usual “I went to Pisa, now watch me stop the tower from collapsing” pose, or some variant of it, depending on location and landmark. It’s a somewhat embarrassing sight, and judging from the looks on the faces of the locals, they agree with me. Don’t let me stop you from taking those images though, if that’s what you want to do, than that’s what you ought to do. There’s always that one moment where you’ll embarrass yourself or someone else, that one moment where you’ll look like an idiot. It’s part of traveling. Just accept that you’re an idiot (during that one moment). The embarrassment is enough to stop me, however. I have no problem with filming, but that might be because I’m used to be being a camera man. I adore movies, I love stories. Films seem like a natural way for me to tell a story. But a photo is a different story (ba-dum tish!). You only have one frame, one picture is all you get to tell that story. One image to capture the mood, the moment, the story. It’s why I prefer taking pictures of other things besides landmarks and vistas. I want my images to tell a story other than “I went there.” But what story I should tell is damn difficult, it doesn’t help I prefer to take pictures with my mind and share them with no one else but me. I’m trying to change that for sake of this website. Up the tablets! Up the Go-Pros! 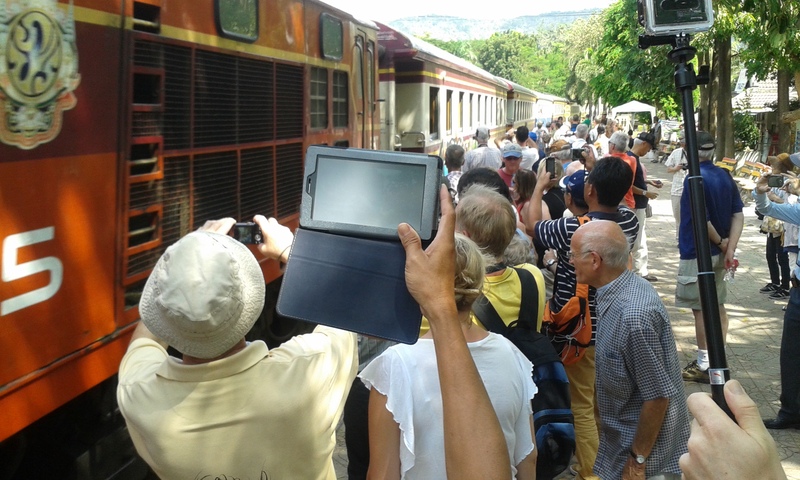 Tourists taking images of a train. Thailand, 2013. The other problem for me, is that I’m simply awful at taking pictures. Photography is not a skill I have mastered. Like I said, filming (with my actual camera) is not a problem. But I don’t have the slightest clue when it comes to taking photos. You’d expect it to be similar, but there are a surprising amount of differences. Finding the right moment to take one is hard enough. Wait too long and you’ll miss it, take it too early and you won’t be ready in time for the right moment. And yes, I still take pictures where, stupidly, my finger gets in front of the lens. Another problem, is equipment. I have no real camera for taking images. I could take my video camera with me, but it weighs a few kilos and would take up all the space in my hand luggage. Of course, I have a smart phone that can take pictures and film, but it’s usually not the greatest of quality, at least not as good as actual dedicated equipment. I might however, try to make a DIY conversion set, to turn my phone in a proper (video) camera. If I succeed I’ll try to post the instruction, though I’m sure there are plenty of those to find on the web already. I applaud the people the people capable of making such stunning photographs. Those images that end up in the latest edition of National Geographic. I’ll try not to roll my eyes too hard at all those who try to take a picture of the Eiffel tower from the same spot. I understand making a still image is hard enough without something special in the background. I’ll try not to curse at you mentally, when you ask me if I could take a picture of you and your spouse. Why do so many people ask me that, anyway? Do I have an air of “photographer” around me? I understand my relatives and friends asking me, because they think my skills as a camera man translate to photography skills. But complete strangers? For their sake, I’ll try to become a better photographer as well.